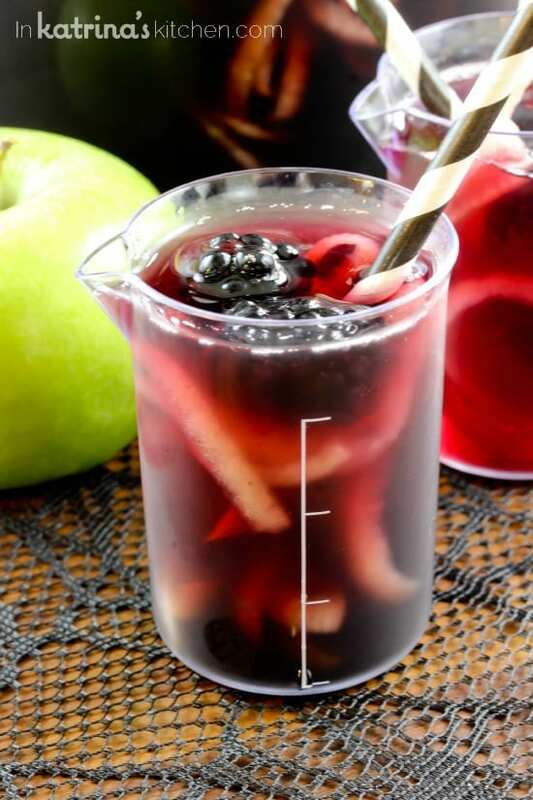 Make this festive Blackberry Apple Spooky Sangria recipe with spirialized apples to really spook your guests! Or substitute juice to make it non-alcoholic for kids. 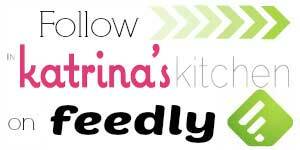 My name is Katrina and I’m addicted to kitchen gadgets. I have egg separators, ice cream sandwich makers, melon ballers, cherry pitters, pickle forks, and enough spatulas to last me several lifetimes of use. Most tools I keep around because they don’t take up a lot of space and what would I DO if I needed those bamboo wooden tongs and they weren’t faithfully waiting for me? But I also have things like shaved-ice machines, donut makers, and spirializers that DO take up a lot of space. They are shoved into every inch of the spaces that I have carved out for myself in our home. I was looking for a new use for my spirializer because I just cannot bear to part with it even though I only use it about once every 2 years. We’ve been through 3 moves together and I have faithfully packed it up and found a new space for it every time. Don’t those long spirialized apple slices just creep you out?! I LOVE them! 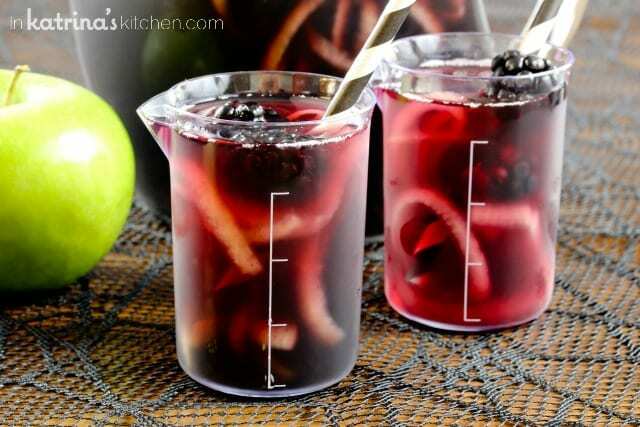 What a killer way to up your sangria-making game this Halloween! I also made some spooky black ice to keep things cool. 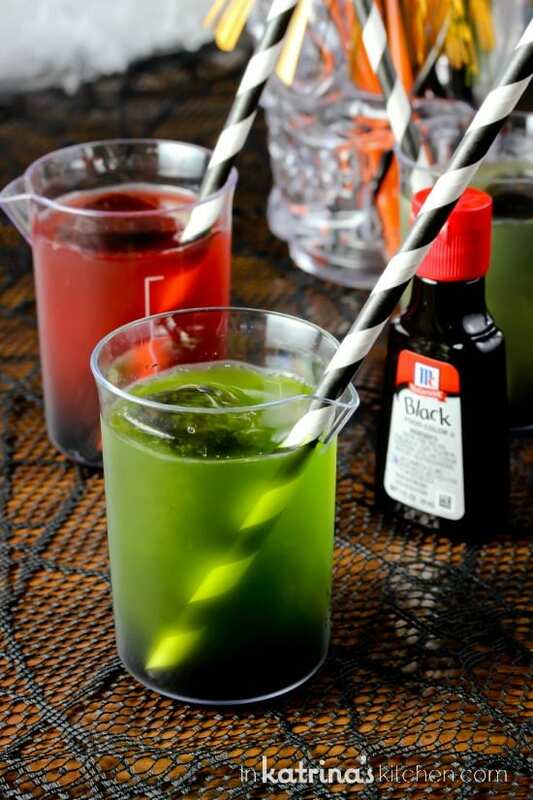 Just a few drops of McCormick black food coloring added to dark juice makes perfectly spooky black ice. For the kids I threw some black ice into plastic beakers along with some colorful sports drinks. I love the ombre effect! Of course you could substitute any dark grape or berry juice for the wine if you wanted to make the whole pitcher kid-friendly. This Green Lagoon Punch recipe is another creepy alternative that my kids are requesting this month. LOVE it! If you are serving this Blackberry Apply Spooky Sangria wine pitcher in mixed company with kiddos I would recommend you writing “Not Safe For Kids” on a piece of bright tape or paper and attaching to the pitcher (and of course keeping out of reach). 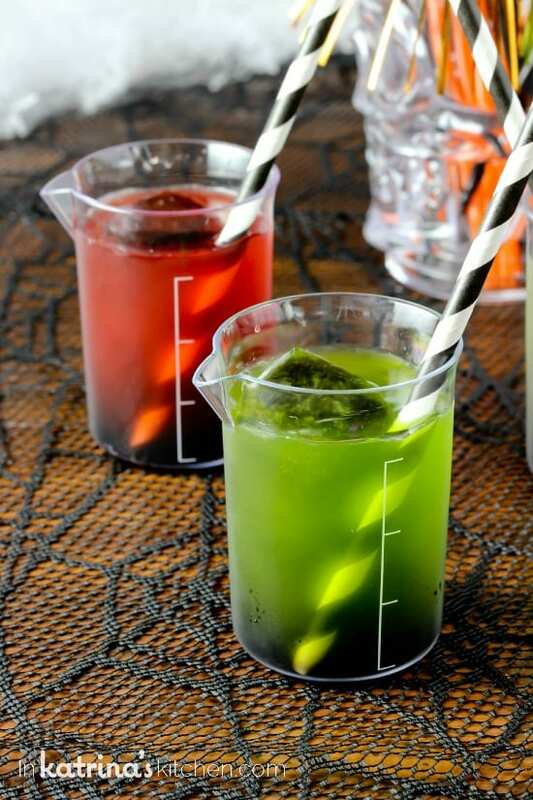 Believe me- little ones will want to get their hands on this spooky drink. 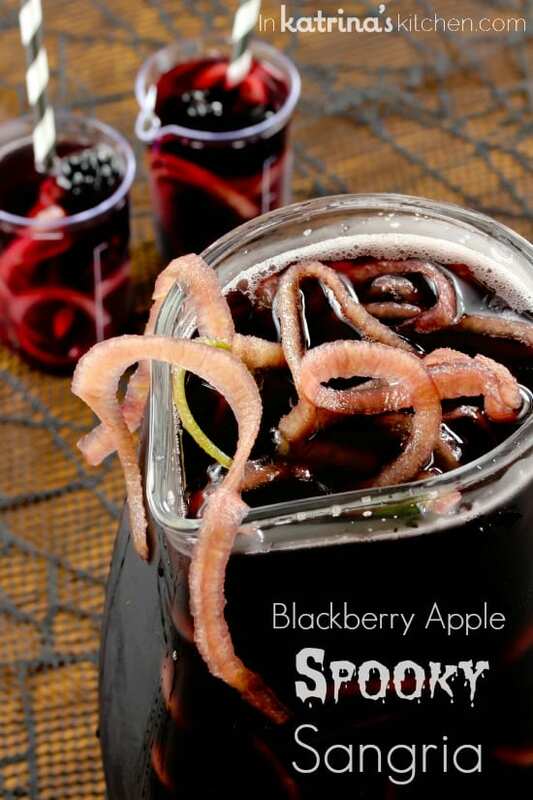 Make this festive Blackberry Apple Spooky Sangria recipe with spirialized apples to really spook your guests! Use juice to make it non-alcoholic for kids. Add 2-3 drops of black food coloring to 1 Cup dark juice. Freeze overnight. 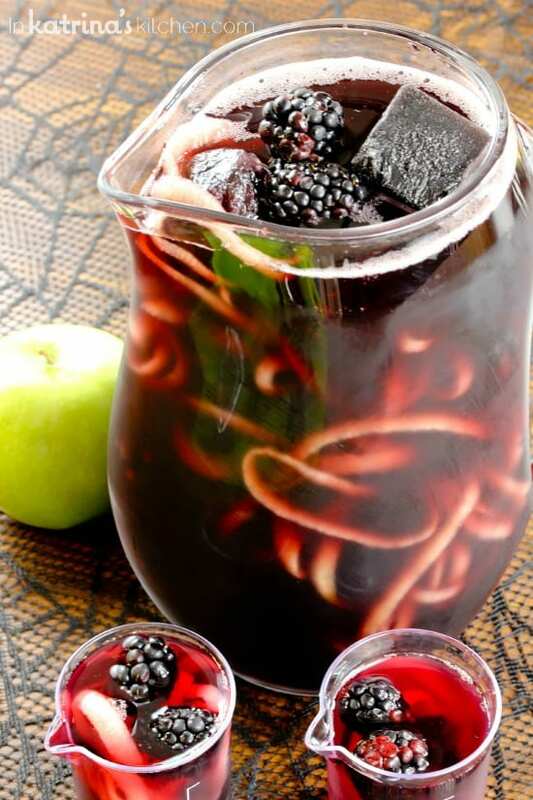 Empty wine, 1 Cup dark juice, apples, and blackberries into a pitcher and stir. Add black ice before serving. It is best to use a silicone ice cube tray when making juice ice cubes (the ice is less likely to get busted into chunks). Any dark juice such as grape, cranberry, pomegranate, or blueberry would work. Oh my gosh, this is just too cute! Love the beakers and I REALLY love the apple spirals. What a great idea! Girl, you and be both! I am running out of drawers and cabinets to put them in!! This sangria is the creepiest! Right?! I need like two extra rooms in my house. I love that you used apple for the worms!! So cute! These are AWESOME! The apples totally look like worms! I love this! Sangria is my all-time favorite drink and the presentation here is perfect. Can’t wait to try it! Thank you! I love that it’s spooky but still delicious. Pure genius! I want to bring this sangria to my friend’s Halloween party! Thank you Lauren! I hope you do!! Such a clever way to use your spiralizer! And the black McCormick food coloring makes me giggle – smart! Thanks so much Ann-Marie! My kids loved the black ice too. I have way too many gadgets, too. But, darn it, they’re too much fun to give up! These spooky sangrias are such a fun idea for Halloween! These are so fun! I love how creative this is. Thanks Naomi! I like to think outside the box for sure! Ack! Those worms are way creepy! This is the perfect spooky drink – love the colors! Pinned! 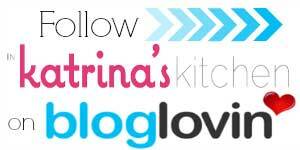 I love my kitchen gadgets too – they have spilled over into the dining room storage! I love creative ice cubes too (I have those contraptions that make large round ice…) and the black is so fun! 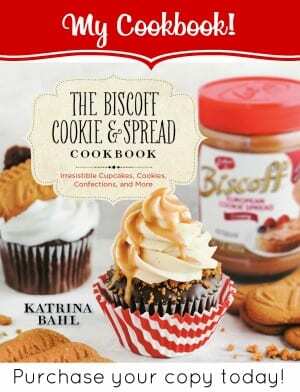 Halloween is one of my favorite excuses to entertain – I have to make this! Oh yes my gadgets are all over the house! And I’m totally trying to figure out a party I can bring this too next time. This is seriously so creepy and awesome!!! My boys would love it!!! And where did you buy the plastic beakers? My prop addiction is dying over those too!!! Thanks! I picked up the beakers at Michael’s- I’m obsessed with them too! That’s amazing!!! And looks so creepy… The thin apple slices looks like worms!! Great idea! Thank you for this post!!! I seriously cannot get over how fun the apple slices are! My kids have been planning what we’re going to serve at our neighborhood Halloween party, and they’re gonna flip when they see this! I love the black food coloring. I have like 3 bottles in my cupboard right now. ha! Thanks so much! Please share a pic with me if you end up making it! I just wanted to say that I was in my local supermarket (in Scotland) the other day and I spotted a jar of Biscoff spread and literally stopped in my tracks. I read about it on your blog ages and ages ago but although it has probably been available in the UK the whole time it wasn’t in mainstream shops, so I didn’t get hold of any. Now I have it and it is AMAZING, and I wouldn’t have known what it was if it weren’t for you (well I could have read the jar, but seeing as I don’t regularly go in for in-depth staring at jars in the spread section I probably wouldn’t have realised). It’s now my new favourite post-workout snack! This is so cool. I love that pitcher and glasses, and I’d drink allllll of this! Thanks Dorothy! It was fun to make. OH MY GOODNESS! This is so great! And a perfect excuse to keep your spiralizer:) I’m adding it to my Halloween menu. Pinned! What sort of red wine would you suggest? This is such a fun drink for Halloween! 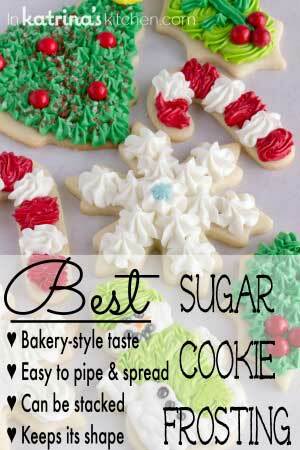 I’m loving those apple spirals and the beaker glasses! This is so creative! I love that you spiralized the apples! I’d love to sip on this sangria! Pinned! 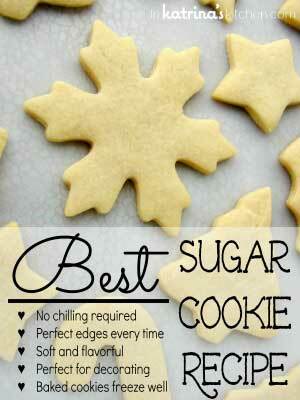 You are my hero with this recipe! Sangria is so happening tonight! I am in awe – this is amazing!! (And seriously spooky, lol.) It’s a great idea and so much fun for Halloween!